Microsoft Surface Laptop with Windows 10 S and 14.5 hours of battery life launched. Microsoft today at the Microsoft Education event announced the launch of a new laptop called Surface Laptop. The new Surface Laptop has up to 14.5 hours of battery life, comes with a 13.5" PixelSense display and runs on new Windows 10 S operating system. At 2.76lbs and 14.47mm at its thickest point, no other laptop this light and thin can match the sleek design, power, performance, and battery life of Surface Laptop. You can open this Surface with just one finger and see the brilliant 13.5" PixelSense display, made with edge-to-edge Corning Gorilla Glass 3. It's the thinnest LCD touch screen display on any laptop. This screen has 3.4M pixels with every pixel color calibrated to give you a vibrant and immersive canvas that draws you in and keeps you focused and engaged. Surface Laptop comes with a 7th Generation Intel Core processor and even as light and thin as it is, up to four more hours of battery power than a 13" MacBook Pro. You don't always need to bring a charger with you to class, or discussion, or study group because Surface Laptop has up to 14.5 hours of battery life. And the Alcantara-covered keyboard and soft palm rest give you a new level of typing comfort during those long days. Surface Laptop is made for and powered by Windows 10 S. And for a limited time, Surface Laptop comes with an offer for one-year subscription to Office 365 Personal and 1TB of free storage on OneDrive, giving you full access to Microsoft Word, Excel, PowerPoint, and OneNote. All your documents will be protected, secure, and stable. You won't have to worry about losing a paper again because everything will automatically save to the cloud. If you need to use an app that isn't in the Windows Store, in just a few clicks can go to the Windows Store and switch to Windows 10 Pro. But you shouldn't. This device, this OS, they're made for each other, and together they offer so much. 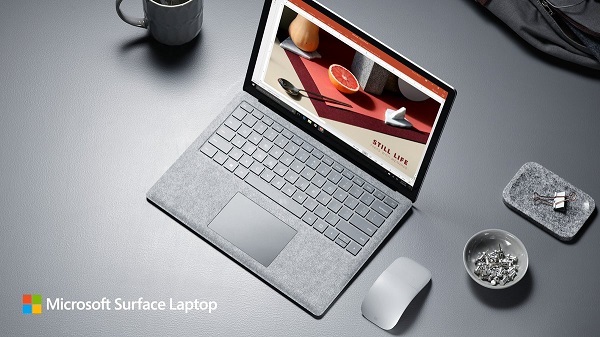 It's everything you love about Windows, Office, and Surface, made pure and elegant in an unbelievably thin and light package. Surface Laptop starts at $999 USD and will be available beginning on June 15th. Customers can pre-order Surface Laptop starting today in the U.S., Australia, New Zealand, Austria, Belgium, Denmark, Finland, France, Germany, Ireland, Italy, Luxembourg, Netherlands, Norway, Poland, Portugal, Spain, Sweden, Switzerland and the United Kingdom where available at Microsoft Store, microsoftstore.com and BestBuy.com. Surface Laptop will come to China later this year and we will announce availability in other markets in coming months.